LIMA, the Langkawi International Maritime and Aerospace Exhibition will return for the 14th time in March this year. The LIMA’17 show will start from 2nd of March to 25th of March and it will be held at the Mahsuri International Exhibition Centre (MIEC) while the Resort World Langkawi will host the marine exhibition. 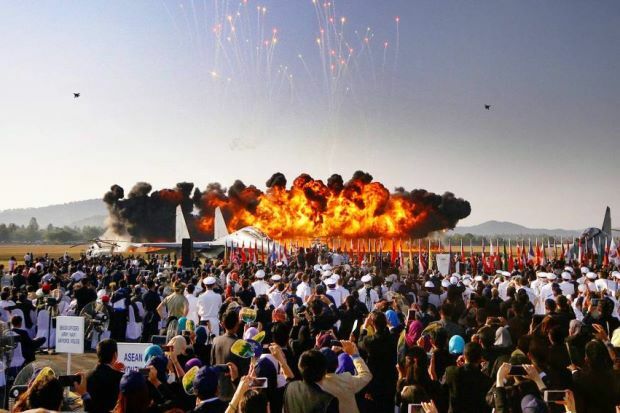 Since its debut in 1999, the LIMA show is held once every two years and it is jointly organized by the Defence Ministry and EN Projects Malaysia Sdn Bhd. LIMA is the largest show of its kind in the entire Asia-Pacific Region with an impressive of international exhibitors and suppliers. Many industry elites from senior Government officials, military delegates, civil delegates, industry movers, and shakers also attend this show because it is a perfect platform for industry stakeholders to engage and expand their networks by building new relationships and making new business agreements. LIMA’17 offers insightful round tables, conferences, and business forums with plenty of invaluable information for businesses to stay ahead of their competition and to take advantage of the new opportunities in the Asia Pacific’s dynamic market. LIMA is an international high-profile event that attracts global interests from different countries and key decision makers in leading global companies will attend the show. Besides that, more than 500 exhibitors from 36 different countries, 147 senior delegations from 39 countries, and 849 accredited media from 26 countries worldwide will also attend LIMA’17. The previous LIMA show in 2015 attracted more than 39684 visitors and generated lots of business interests. The first 3 days of LIMA’17 exhibition is strictly exclusive to trade visitors and professionals. The entrance ticket is RM100 per person and it is valid for the entire duration of the show. The trade pass offer also offers access to the MIEC & Resorts World exhibition hall. Discounted entrance tickets are available from LIMA’s official trade magazine and the public also have a chance to win a free ticket by participating in LIMA’17 weekly contest on social media including Facebook and Twitter. For more information, kindly refer to LIMA’s Facebook page and Twitter account. Deadline for online pre-registration will end on 20th of February 2017 Malaysian time and all pre-registered trade visitors will get a confirmation email before the show. You will need different accounts if you are planning to register for more than one person. Pre-registration can now be made on LIMA’17 official website and it is only RM80 per person. On the day itself, please present your confirmation email at the MIEC registration counter to collect the trade visitor pass. LIMA requires all walk-in attendees to bring their business cards and to fill up the entry ticket with their personal details and other demographic information. The trade visitors will also get the show directory for free. It is also important for exhibitors to know that they will be given complimentary entry tickets or digital invitations. Exhibitors need to present their completed forms or email confirmation at the registration counter to receive the free entry. The Visitor Information Counter is at the Main Entrance Hall and in there, you will find a dedicated team ready to help you to make the best use of your time at the LIMA’17 show.